Adalimumab, which is a patent product of the Abott Biotechnology Ltd., is a medication used for treatment of ulcerative colitis, psoriatic arthritis and rheumatoid arthritis. It also known as HUMIRA, intended to inject subcutaneously. Side effects of this product are vomiting, nausea, internal bleeding, psoriasis, anaphylaxis, respiratory tract infections, hepatitis B infection, liver injuries and headache etc. Invented by Jochen Salfeld, Adalimumab is accessible as a pre-filled, single use syringe. In December 2002, the U.S. FDA approved adalimumab for indications such as psoriatic arthritis, Crohn's disease, plaque psoriasis, ankylosing spondylitis, rheumatoid arthritis and ulcerative colitis etc. Rising occurrence of arthritis is among the key drivers boosting the growth of the this market. The population of women is at a greater chance of arthritis because of huge loss of calcium from the body in comparison to the males. This is expected to fuel demand for adalimumab over the forecast period. Furthermore, the sedentary lifestyle of people across the globe aids in increasing arthritis prevalence. As per the Centre of Disease Prevention and Control, a large number of adults in U.S. have been found to have rheumatoid arthritis, arthritis, lupus, fibromyalgia and gout. However, increasing prices of adalimumab is among the key hindrance to the global market. Adalimumab market is classified into applications as Rheumatoid Arthritis, Psoriasis, Crohn’s Disease, Ulcerative Colitis and Others. Further, the Global Adalimumab Market is bifurcated by regions into North America, Asia Pacific (APAC), Europe and Rest of the World. Presently, Europe and North America account for the largest market share in the global market. 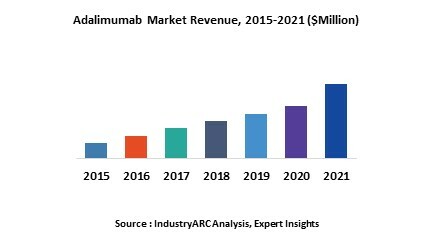 Factors that include advanced healthcare infrastructure and reimbursement coverage and availability of well-organized regulatory framework are the major drivers of the adalimumab market in Europe and North America market. Followed by which, Asia Pacific market is expected to witness a significant rise during the forecast period due to factors like rising disposable income, rapidly developing healthcare infrastructure and municipality/government measures to improve the healthcare sector. India and China amount as the highest population globally. Therefore, geriatric population across India and China is analyzed to grow in the near future as a result of which the adalimumab market is expected to witness a growth in the market. Abundance of geriatric population is further analyzed to bolster the anti-arthritis drugs demand.